Today, there aren’t many places where the ground has been undisturbed since the end of the First World War. 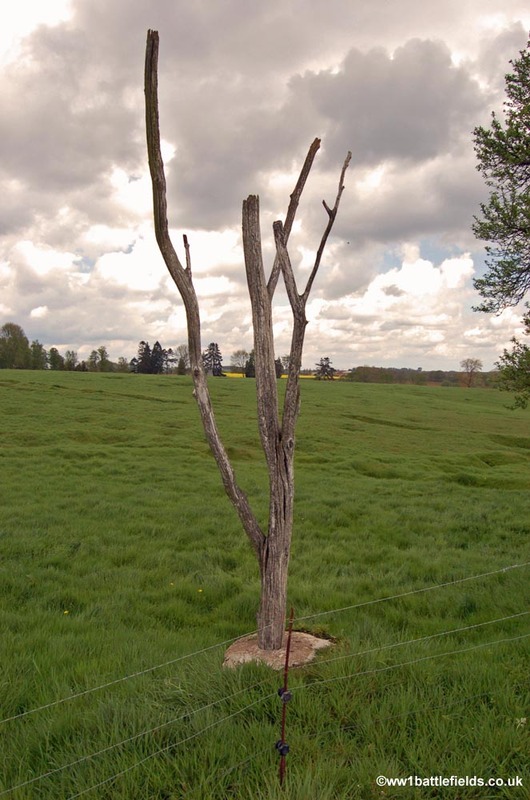 However, the Newfoundland Memorial Park, near Beaumont Hamel, is one of those, and one of the largest areas on the Western Front where shell-holes and the trenches of both sides can still be clearly seen and even entered and walked along – see the satellite image below. Another such site is Vimy Ridge near Arras. Newfoundland Memorial Park is therefore one of the sites on the Somme which should be high on the list for all battlefield visitors. It is located 5 miles north of Albert, and the main entrance to the Park can be found on the D73 road between Hamel and Auchonvillers. 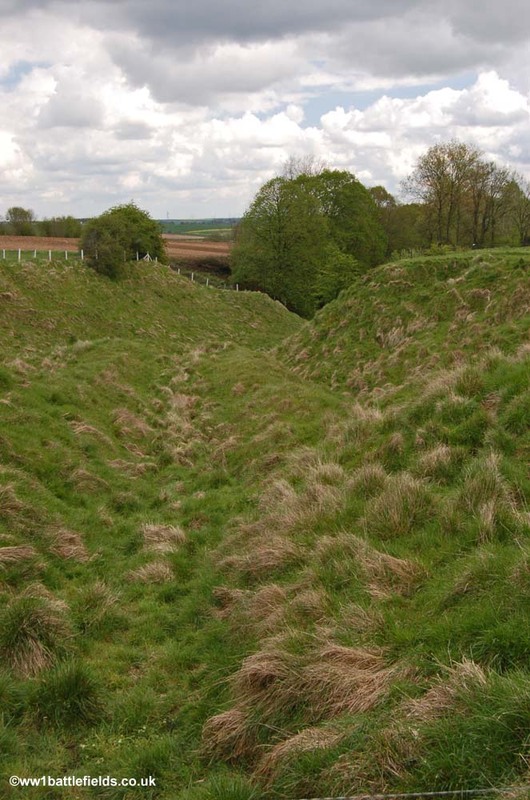 Guidebooks covering this area and the Somme battlefields include Major & Mrs Holt’s Battlefield Guide to the Somme, the Middlebrook’s Guide to the Somme Battlefields and the Bradt World War I Battlefields Guide. There is a great deal to see within the park, including memorials and cemeteries as well as the preserved trench lines. There is also a visitors centre with information on the Newfoundlanders and also a shop and toilets. 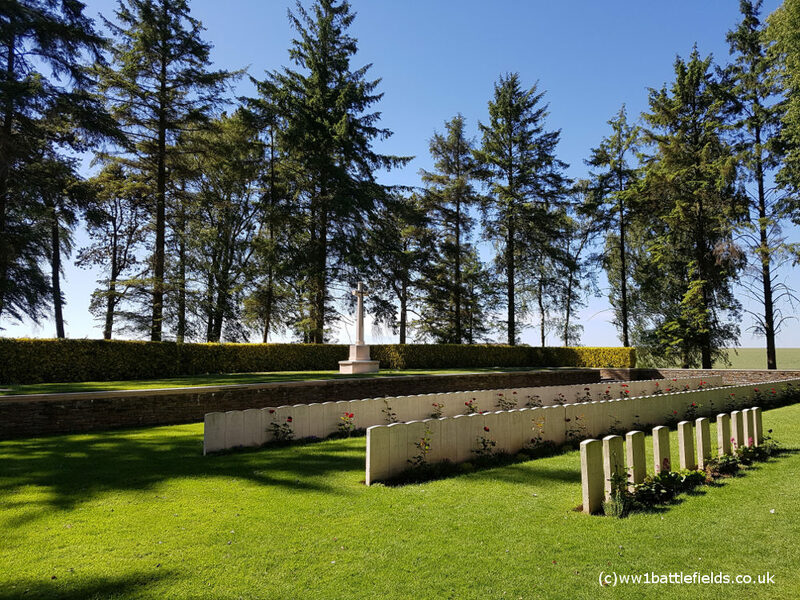 There’s more to see of interest in and around the nearby village of Beaumont Hamel itself. 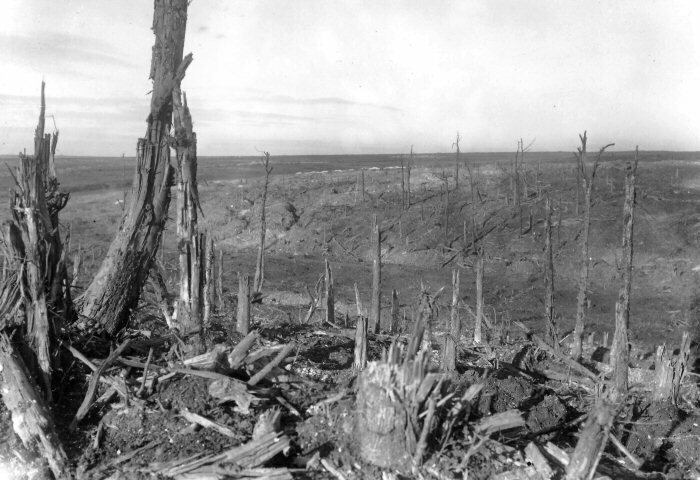 A wartime view of the battlefield at Beaumont Hamel. Q1523: Photograph courtesy of the Imperial War Museum, London. The area has been maintained because of the significance to Newfoundland; the Newfoundland Regiment, part of the 29th Division, which attacked here on the 1st of July 1916 and suffered appalling losses. After the War, Newfoundland purchased this land in 1921, and first it and then the Canadian government (after 1949) have maintained it ever since as a memorial. It was officially opened in 1925, by Earl Haig. In 1997 it was designated a Canadian National Historic Site, and young Canadians volunteer to spend some time here, greeting visitors and providing information on the park and its history. 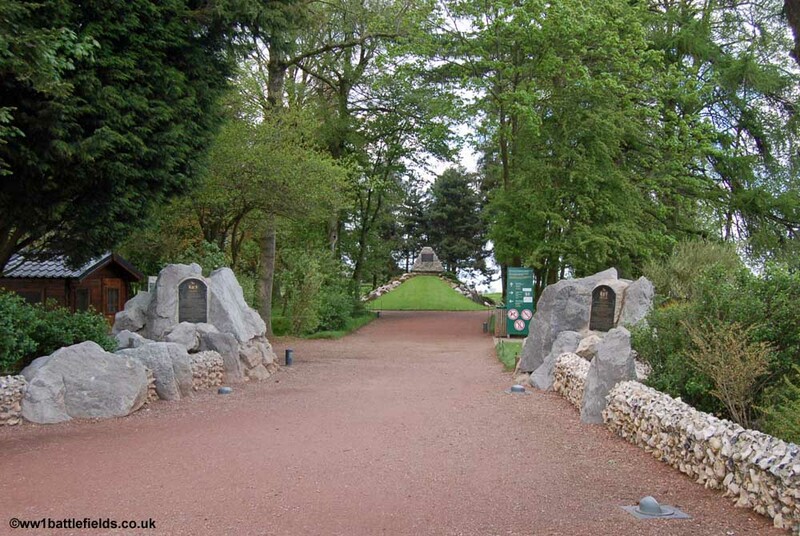 Just inside the entrance to the Park is a memorial to the 29th Division (centre picture below). This was unveiled when the Park opened, on the 7th of June 1925, with a guard of honour which included men who had served with the 29th in the Great War. The 29th Division was in action at Gallipoli, before coming to France in April 1916. 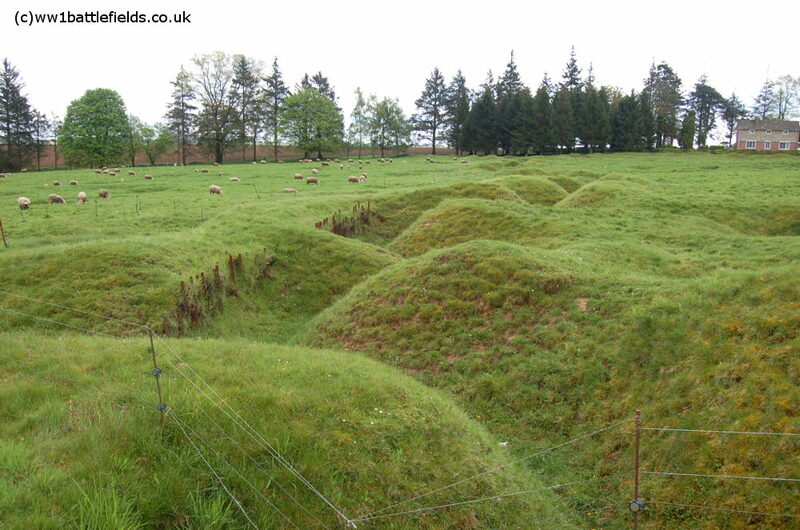 On the 1st of July, some troops of the 29th Division did reach the village of Beaumont Hamel, but were forced back. 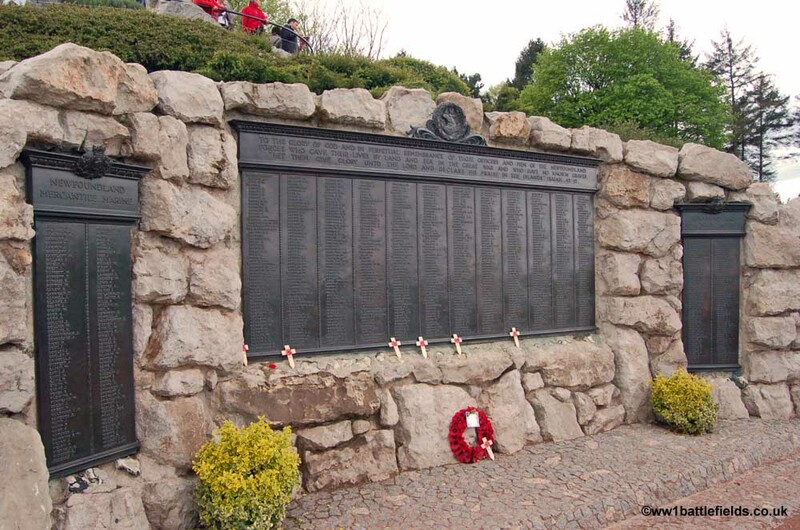 The village was not taken until the 13th of November, when the 51st (Highland) Division successfully attacked. There is a memorial to that Division on the other side of the Park (see below). This large memorial is located a little further into the park, heading straight on. 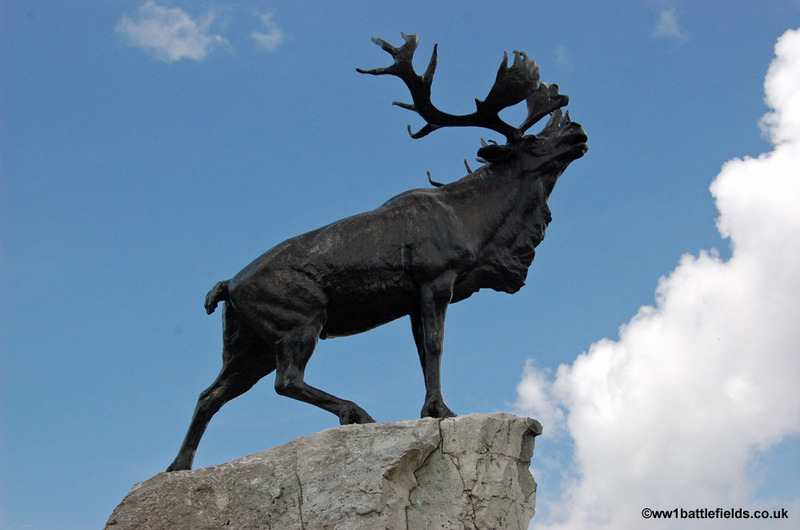 The statue of the Caribou was chosen for the Memorial, as it was the symbol of the Newfoundland Regiment. 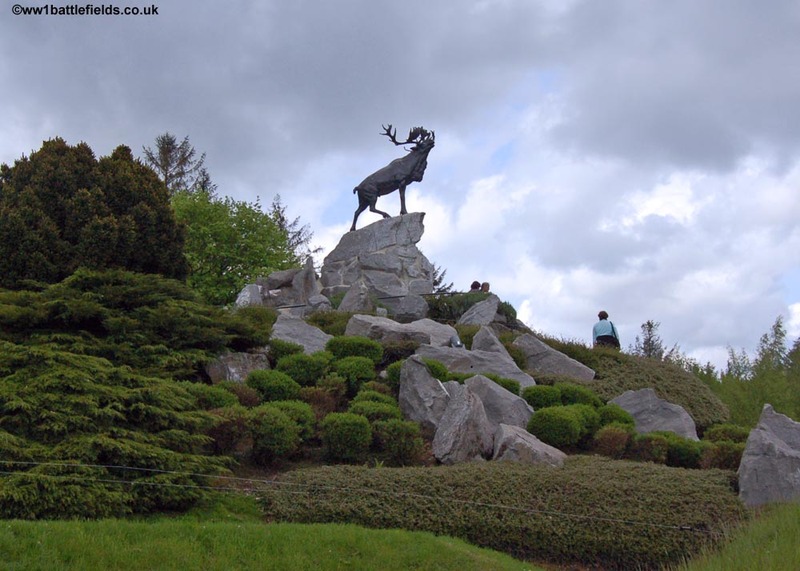 Similar caribou statues are also located at a number of other sites on the Western Front where the regiment was in action. Steps lead up to the Caribou, and the vantage point here is an excellent place to look over the battlefield where the Newfoundlanders fought on the 1st of July, 1916. Set into the stones at the base of the mound on which the caribou stands are three bronze panels listing Newfoundland’s missing. The central panel (pictured below) lists the missing of the Newfoundland regiment, whilst the two smaller panels on either side list the naval and mercantile missing. The Caribou and memorial here was unveiled by Lord Haig on a beautiful June day in 1925, and J. R. Bennett, the Newfoundland Colonial Secretary, also gave a speech. Lord Haig toured the park, which in those days was little changed from the war, with barbed wire entanglements, shellholes, rifles and other war debris still scattered around. Just in front of the Caribou are the original 1st of July frontline trenches that the British and Newfoundland troops attacked from (left picture above). 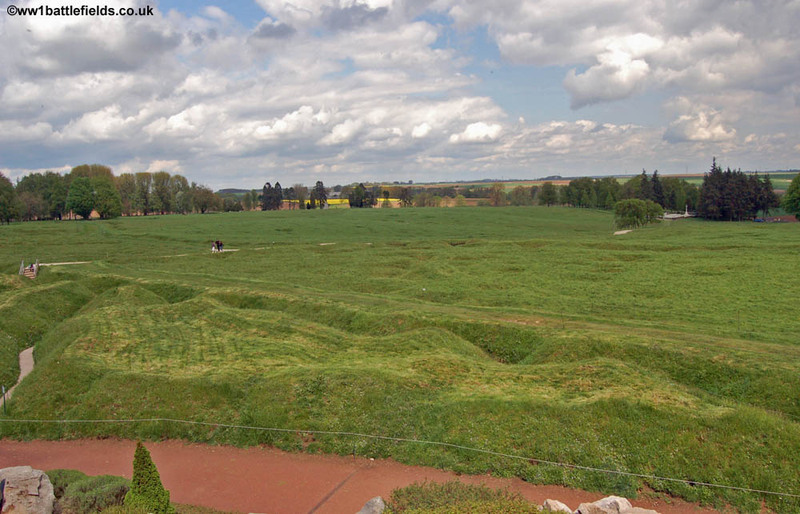 The right hand photo above was taken from the steps up to Caribou, and shows the view past the Allied trench lines in the foreground, and across No Mans Land where the attack on the 1st July 1916 took place. The German trenches are at the rear of the picture. 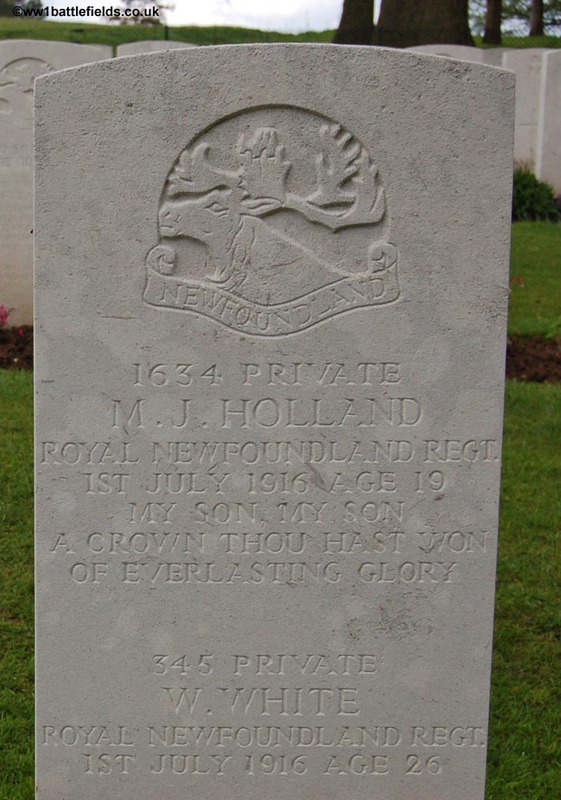 The Newfoundland Regiment attacked as part of the second wave, at 9.15 a.m. Within half an hour they had suffered terrible losses, with more than 90% becoming casualties. There is marked paths to follow through the park once past the Caribou, and the remains of trenches and shell-holes are clear to see. There are still a few silent pickets visible (these were corkscrew ended metal poles used to support barbed wire). Immediately after the war, there was a great deal of such war material lying around here, and access to most of the Park was permitted. Today, due to the numbers of visitors, access is limited to a few areas. 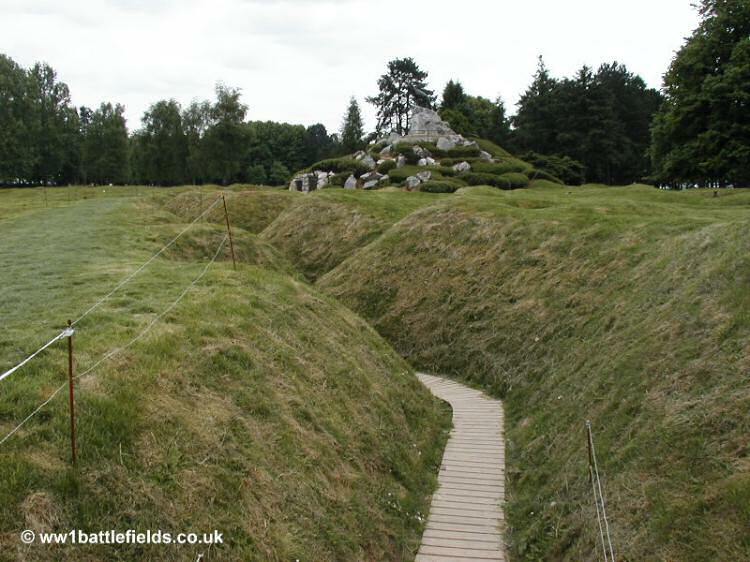 It’s possible to enter the preserved trenches near the caribou and walk along the zigzagging trenches – they were built this way so that if a shell fell in the trench the blast would be contained and should only affect a small area. Unlike many other areas on the 1st of July Somme attacks, the Allied advance here was actually downhill. However, there was no cover, and the advancing troops were met by machine-gun fire. About half-way across No Mans Land is the Danger Tree (centre picture above) – a preserved tree, thought to be original, which probably marks about the limit of any Newfoundlander’s advance that day. A little further on is another clear zigzagging shallow trenchline in the grass (right photo above). This is not from the 1st of July attacks, but from November 1916. 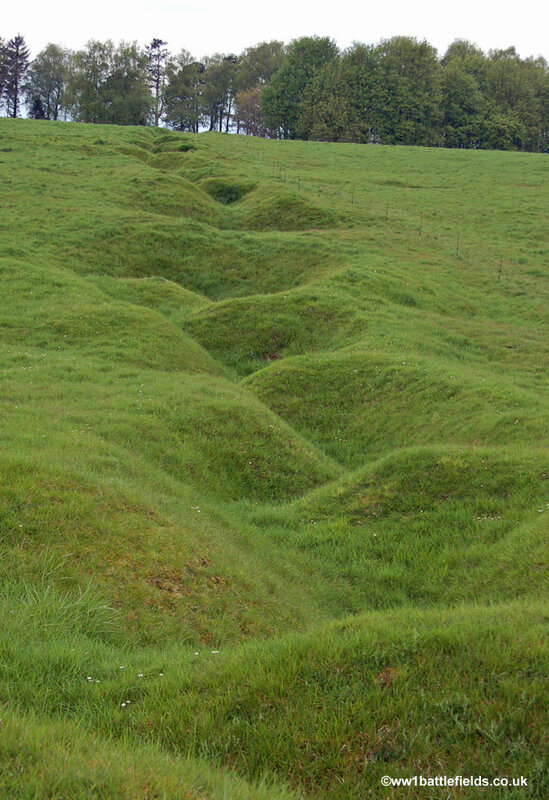 The trench was created as an advanced line from which troops could more easily reach the German front line and Y Ravine. This attack, made on November the 13th, was successful, and the village of Beaumont Hamel itself was also taken that day. Continuing towards the rear of the Park, the track passes Y Ravine Cemetery (see below) and after this the original trenches of the German front line of July the 1st are reached. The left picture below shows these. Just by this, and near to the 51st Division Memorial, is Y Ravine (see right hand photo above). This is actually a natural feature, but it was used by the Germans and contained dugouts and also tunnels leading up to the German front line. 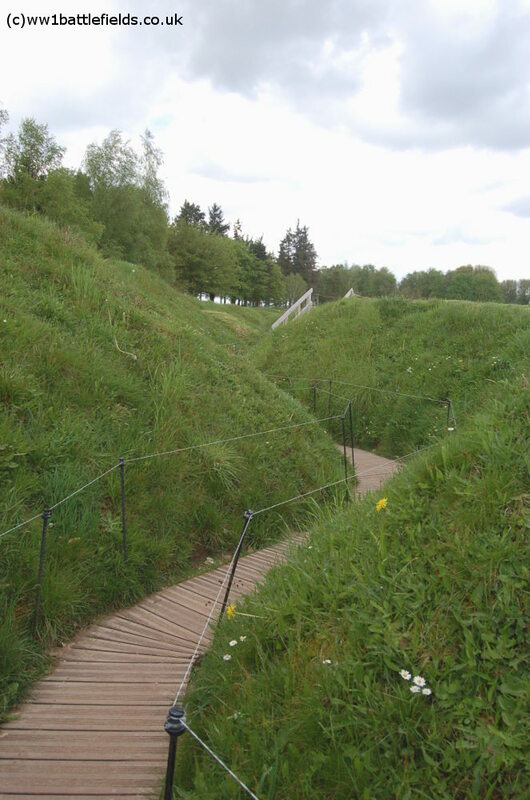 Behind Y Ravine is the rear entrance to the Park, and a path leads from here to Beaumont Hamel. This means a visit to Newfoundland Park can be combined with a walk of the area (a good example is the ‘Ancre Valley’ walk in Paul Reed’s Walking the Somme). There are three war cemeteries and two other memorials located within the boundaries of the park, and these are described below. Y Ravine Cemetery is located towards the right hand side of the Park as you look downhill from the Caribou. 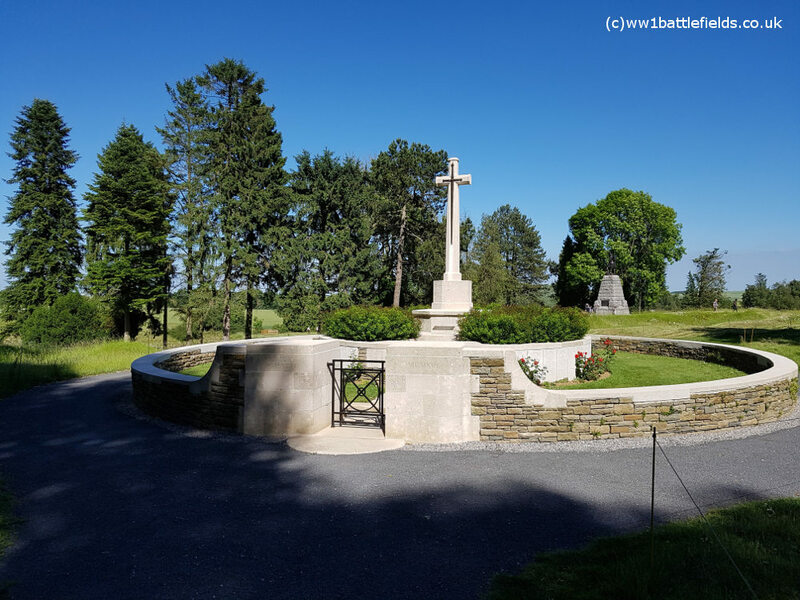 The Cemetery was started in Winter 1916, as the battlefield here was cleared, and hence a very large proportion (over a third) of the 400 or so burials are unidentified. However, 38 Newfoundlanders are buried here. Many of the headstones commemorate two soldiers, and this reflects the fact that this is in effect a mass grave. On the headstone of Private Charles Taylor, one of the Newfoundlanders who died on the 1st of July, aged 23 the inscription reads ‘His last words when leaving home were “I have only once to die”‘. Y Ravine Cemetery also contains sixty-one special memorials to men known or believed to be buried here, and these are located along the left and right hand walls. Hunter’s Cemetery is located at the rear left of he Park, near to the 51st Highland Division Memorial (see below). It is a very unusual cemetery design. 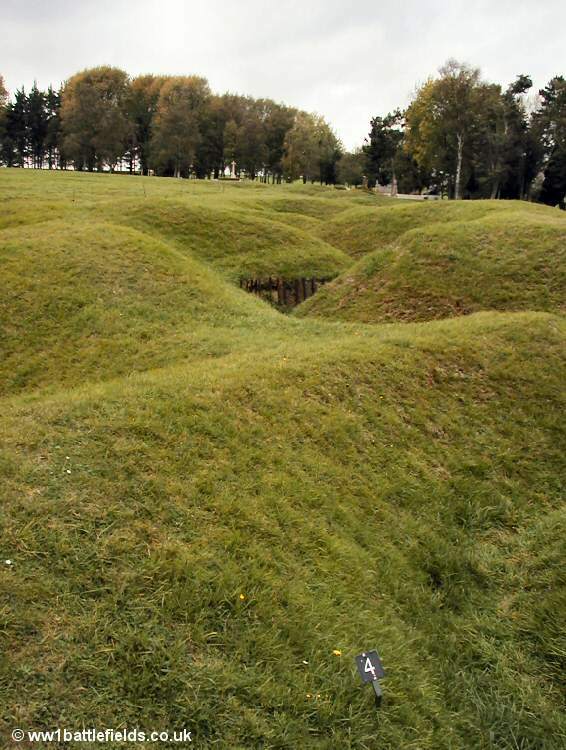 Forty-six soldiers of the 51st Division who fell during the taking of Beaumont Hamel in November 1916 were buried here in a large shellhole. 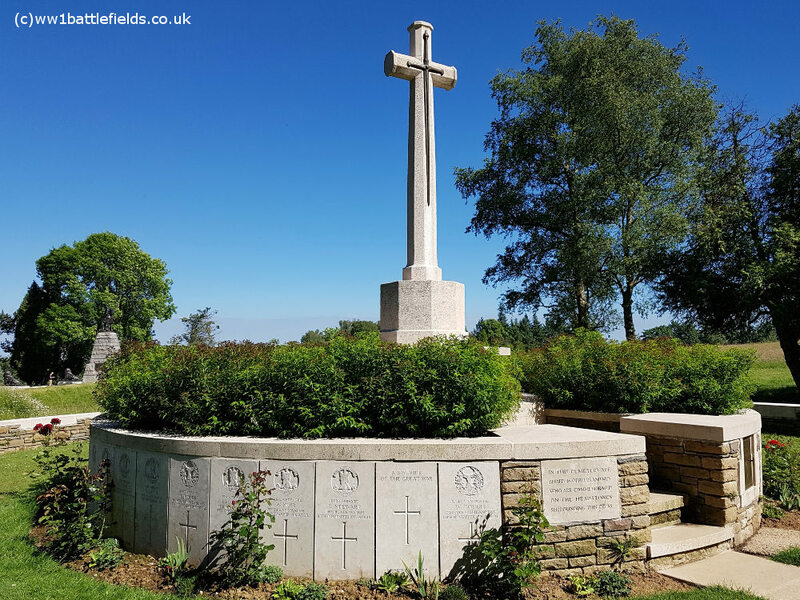 This is reflected by the headstones, which do not stand alone as grave markers, but are set into a central wall around the Cross of Sacrifice, as shown in the pictures below. All the known casualties (41) buried here except one died on the 13th of November, and all except two are men of the Black Watch (6th and 7th battalions) or Gordon Highlanders. 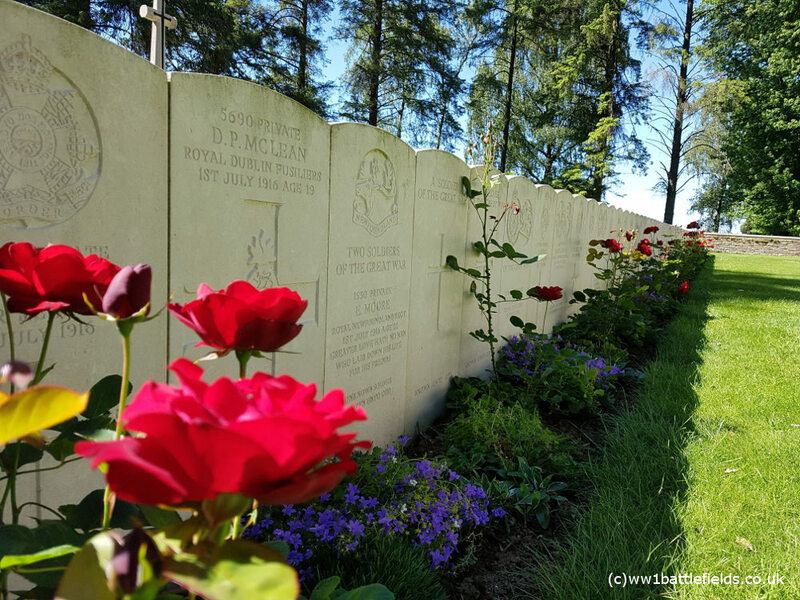 The reason for the name ‘Hunter’s Cemetery’ may come from a Chaplain attached to the Black Watch (according to the CWGC website). This is an open-fronted cemetery with a low wall surrounding the sides and back. It is located at the left rear of the Park as you look from the Caribou. It was originally called ‘V Corps No. 12 Cemetery’, and was made by V Corps in the spring of 1917. There are two or three soldiers commemorated on many of the headstones here. There are just over 200 buried, around a quarter of which are unidentified soldiers. 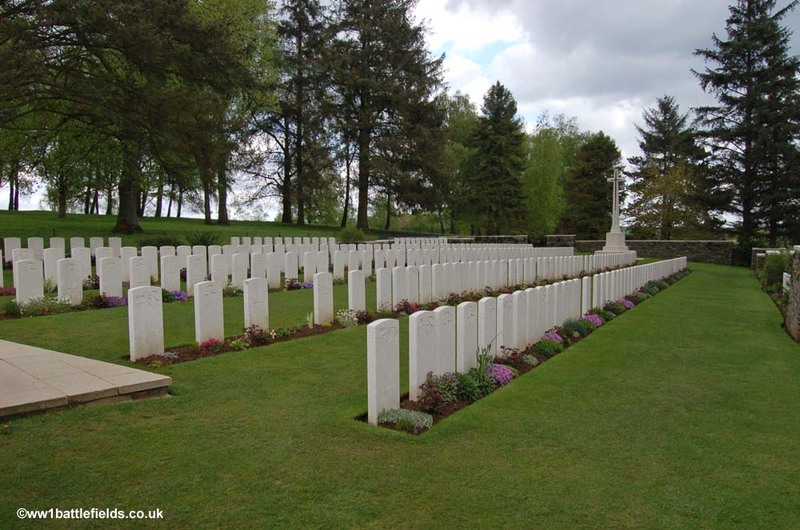 The majority of the burials are of men of the 29th Division who fell on the 1st of July, although there are some burials from both earlier and later. A small number of graves were added at the front of the cemetery after the war. There are actually ten graves in total in this later row (Row C), five of which are the graves of Newfoundland men (four unknown and Private William King). 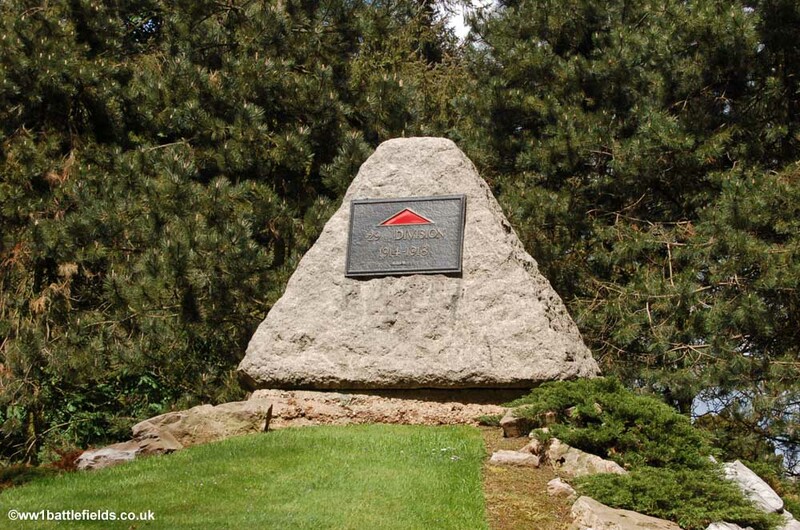 The 51st Division memorial is found towards the rear of the Park, not far from Hunter’s Cemetery. This is an impressive structure. It takes the form of a rough blocks of Rubislaw granite which were produced by Garden & Co. in Aberdeen, and are assembled in a pyramid form. 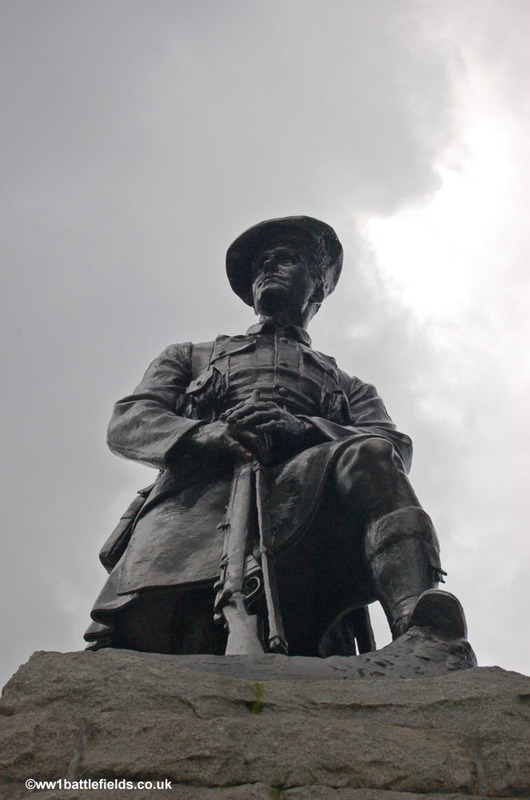 On the top stands a statue of a kilted Highland soldier. He is looking east towards the village of Beaumont Hamel which men of the 51st Division took on 13th November 1916. The three panels on the pyramid bear inscriptions in Gaelic, English and French. 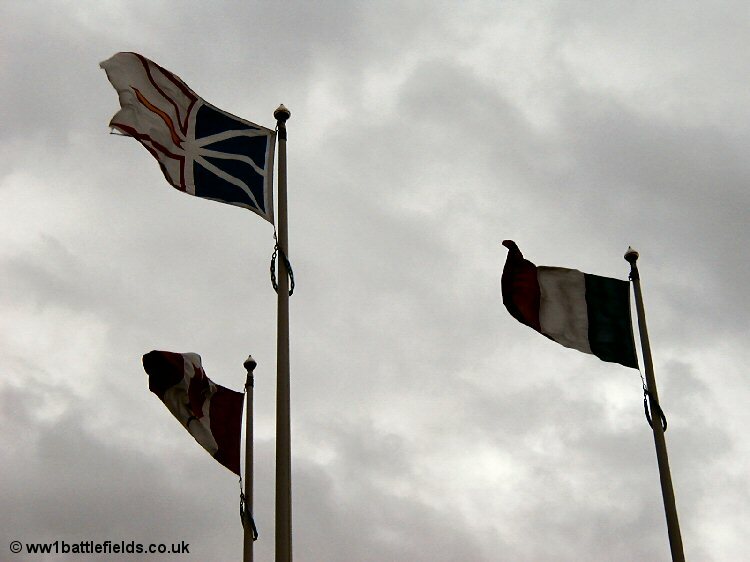 The Gaelic words can be translated as ‘Friends are good on the day of battle‘. 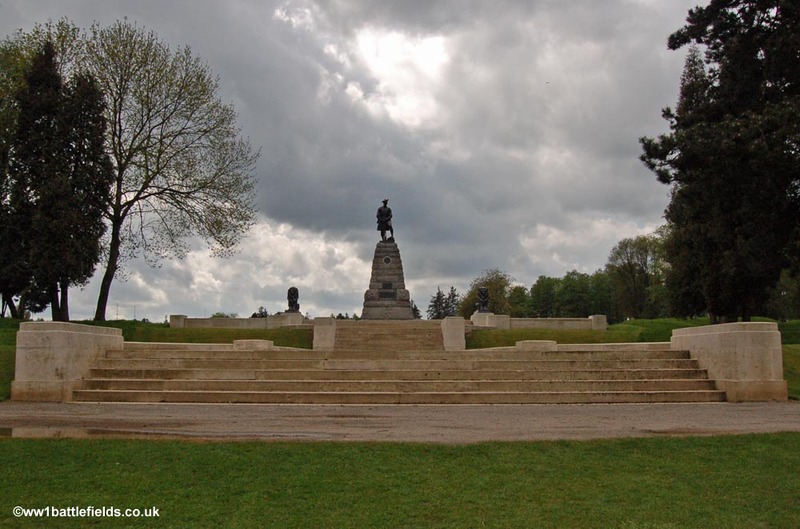 The monument was initially unveiled by Marshal Foch in September 1924, following a procession from Beaumont Hamel village to the site. Foch concluded his speech with the words “Sons of Scotland, sleep in peace”. The memorial was originally dedicated by the Reverend Sinclair, who had been a chaplain with the Division. Pipers played, and the school-children of the area were among the crowds. During the Second World War, the Germans planned at one point to remove the statue to reclaim the bronze, but in the event they didn’t. The memorial was rededicated on the 13th of July 1958 and so the front panel now also refers to those who died in the Second as well as the First World War. Two splendid lions flank the memorial. Directly opposite, and in front of Y ravine, is another memorial to the 51st Division, a simple wooden cross. This is shown in the right hand photo above. 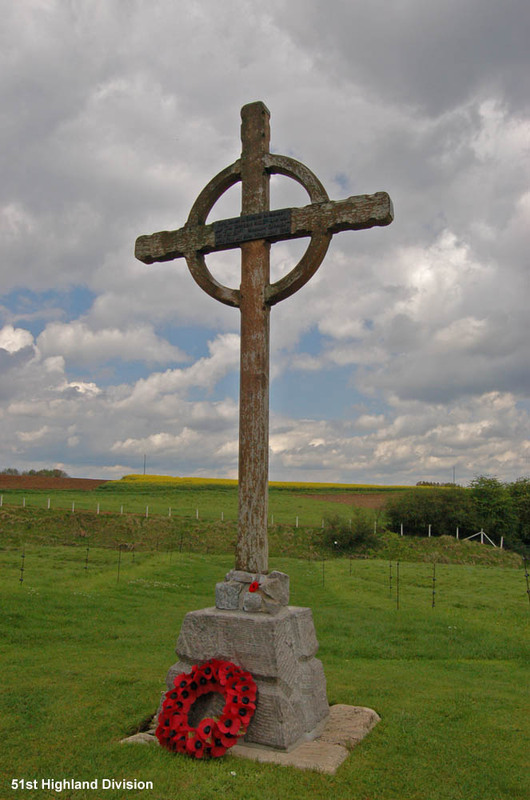 The cross originally stood at High Wood, and the inscription reads “This Cross is erected in memory of the Officers, NCOs and men of the 51st Highland Division who fell at High Wood July 1916“. The Division was in action there on the 23rd of July, when the 4th Gordons and 9th Royal Scots between them suffered 450 casualties, and also on the 29th of July (4th Seaforths). Another page covers High Wood in more detail.